I've gotta say, when I first laid eyes upon Grapette I didn't think it was a store brand soda. After further investigating, I realized that it was Wal-Marts version of grape soda. I looked around for the Sam's Choice grape soda, but I couldn't find it, so I assumed that Wal-Mart had put all of their eggs in the Grapette basket... I was only partially right as the Grapette website reveals. So as you see, Grapette has been a part of Wal-Mart for a while... it was just recently that we have the official Grapette name, and flavor. One thing from the Q and A portion of the website that bothered me. Q: Is Sam's Choice Grapette the authentic Grapette? A: Yes. Grapette International, Inc. is part of the original Grapette Company formed in Camden, Arkansas in 1939, with use of all the original formulas. Using these formulas, Sam's Choice Grapette and Orangette have the same great flavor profiles of the sodas you remember. Looking at the ingredients on the side of the can I see words like, High Fructose Corn Syrup, and Potassium Benzoate. Without looking I can safely assume that High Fructose Corn Syrup was not part of the original sweetening. So that lie bothers me. Well now, with all of the history out of the way, here goes the test. At first look I really enjoy the can art it's displaying. It's retro, and thirst provoking. 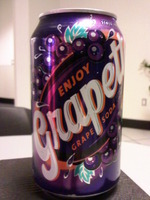 I say that because, when I read "Enjoy Grapette Grape Soda" I really want to drink it. Maybe I'm easily swayed, but oh well, it's time to drink either way. Wow... I can say that I'm impressed. It's got a good grape taste, and a slight kick to it. It doesn't leave too much of an after taste either. In fact after the initial bite it slowly fades away to be quite smooth. The cost of Grapette is quite cheap, and it should be readily available at your local Wal-Mart. Other than the lie (or what I am assuming is a lie) that they use the original formula, this is easily a top 3 grape soda. My favorite of all time is still Mighty Grape, but that's mostly because of it's association with my childhood. I haven't had Mighty Grape in over 15 years, but I hope to find it. Any who, I digress... Grapette is my favorite store brand soda to date, and I highly recommend it. I really wish that other stores would try and go the route of Wal-Mart when it comes to their sodas (I know they don't have the money Wal-Mart does, but they could still try a little harder.) Since Grapette was such a success I will also review Orangette, and their Keg Style Root Beer in the near future.